Today’s Bible readings can be found here: Proverbs 16:18-33 & John 4:1-26. The best water I’ve ever tasted came directly from my mom’s kitchen tap (faucet) in our Glasgow home. I can remember during some hot summer days running in from the backyard to stick my head under the cold tap and guzzle as much of the pure clear Scottish water in order to slake my thirst. Some folks reading this have probably done something similar as a child by drinking cold water directly from a garden hose. You feel totally refreshed within seconds and very soon your thirst is completely satisfied. Just like our bodies, our spirits get thirsty, too. We run ourselves ragged with all the business and responsibilities in our lives. We use up all of our energy looking after family, keeping up with work, and getting through each day. We may sometimes feel everything is uphill for a while and end up emptying ourselves emotionally, mentally, and spiritually. We need to refresh our weary souls and renew our tired spirits. In other words, we need to reconnect with God to fill ourselves up with His grace, care, and love. 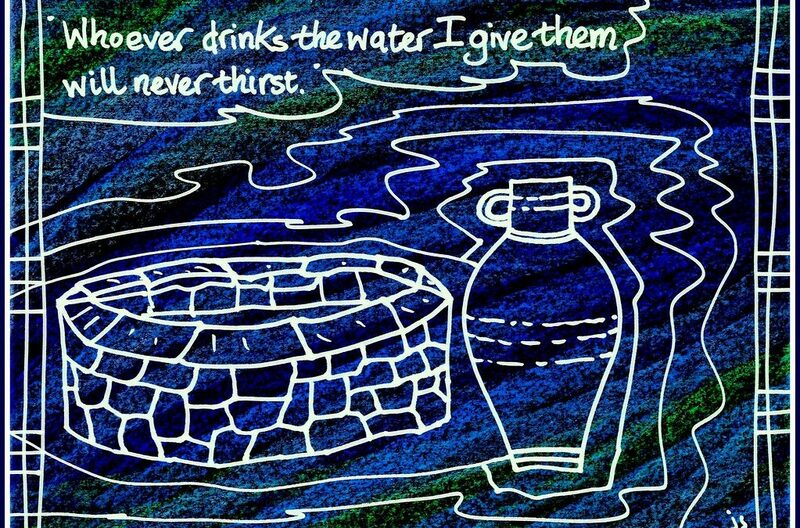 This is why Jesus talks about being living water. He is the One we can tap into in order to quench our spiritual thirst and satisfy our parched souls. He has words to comfort us, ways to guide us, and the will to refresh us. All we have to do is to trust Him and seek His living water for ourselves. Whatever you are facing today, however, empty you feel, and wherever you go, seek Christ and receive His love, mercy, and strength. Point to ponder: How much do I need Jesus to help me today? When can I make time to seek Him? Prayer: Lord Jesus, You know us completely and are aware of how empty we feel. Fill us up with Your living water and refresh our weary souls. In Your Holy Name, we pray. Amen. 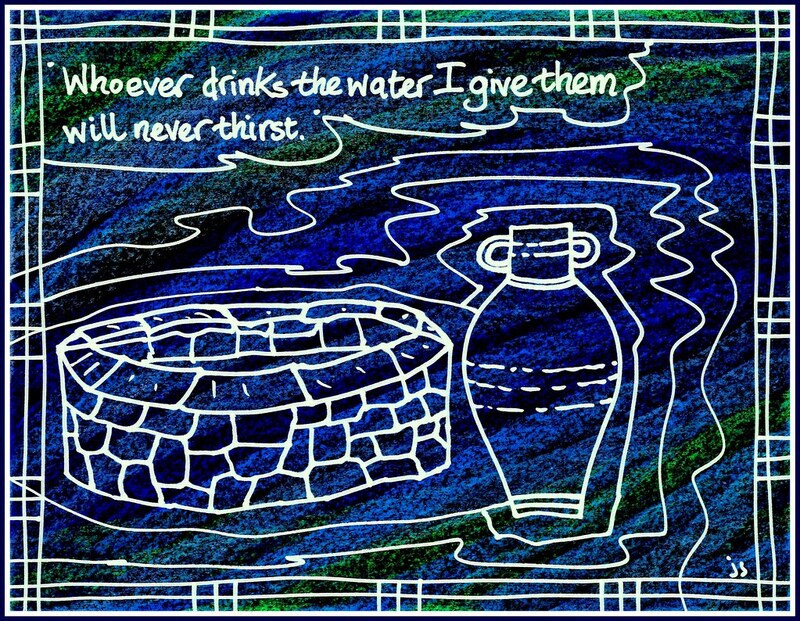 Today’s image is one of John’s living water drawings. If you would like to view a larger version, please click here.